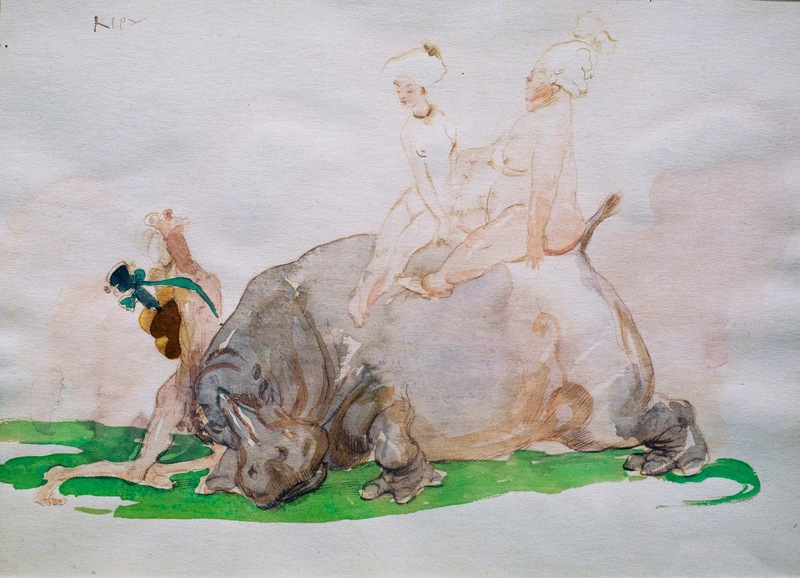 In this watercolor by Heinrich Kley a troubadour tries to move a hippo, who carries two baroque ladies resting on his back. Who knows if there is any special meaning to this situation or wether it reflects any social commentary during the early 1900s, when it was painted. Maybe the hippo represents the German economy, which wasn’t moving, who knows? But by itself it’s quite a beautiful piece to study. The image was already somewhat faded when I got it, but with a little help from photoshop it’s possible to bring this scene back to life. The guy is giving all he’s got to make the hippo budge, while the two women wait comfortably for the ride to eventually continue.